- Used the Sector-Led Plan to highlight the sector’s role as an employer and investor in Norfolk, bringing an estimated £57m additional funding into the county and involving an estimated 84,000 people as staff or volunteers. - Brought the local sector together to share skills and learning at the Stronger Together conference, with more than 150 delegates representing 90 different organisations. 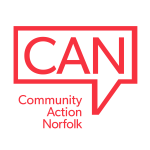 - Published a robust evidence base about Norfolk’s voluntary, community and social enterprise sector. The report was based on Charity Commission information as well as views from across the sector: we heard from 137 delegates at workshops, 68 interviewees and 282 survey respondents. - Established a Systems Leadership Group with a clear and open process for appointed and elected members.